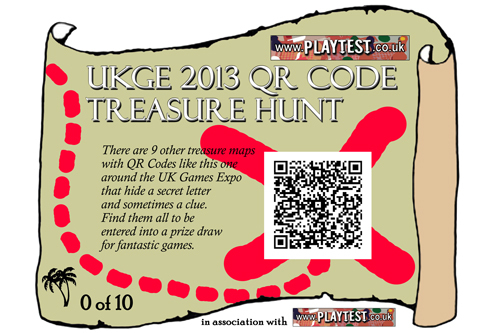 For pirates and adventurers, I have created a QR Code Treasure Hunt to run at the UK Games Expo 2013 this weekend. The object is to find all of the treasure maps, which when scanned give clues to other locations. 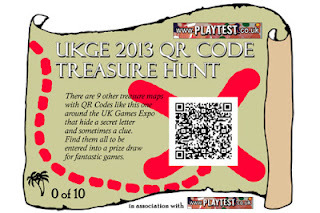 When you have found them you can solve a puzzle to be entered into a prize draw for a hoard of gaming goodness. Players will need smartphones with a QR Code reader and a sense of adventure, but the game doesn't require internet or network access to play. Be sure to download a QR Code Reader app from the Android or Apple Store before playing. Looking forward to seeing you all at Expo!